Private equity firms buy stakes in private companies with the hope of making a profit by later selling those stakes for more than was initially invested. Private equity firms have a “buy low, grow fast, sell high” strategy. It’s like the stock market but instead of stocks in public businesses, private equity firms trade ownership stakes in private businesses. How is private equity different than venture capital and other forms of private business capital? Private equity firms invest in companies that are in the growth stage of their life cycle. Private equity firms generally want to see at least three years of profitability before investing. Friends, families & fools (FFF), angel investors, and venture capital will invest in start-up’s or in companies in the early stages of their life. These companies are often pre-profit or in their first few years of turning a profit. 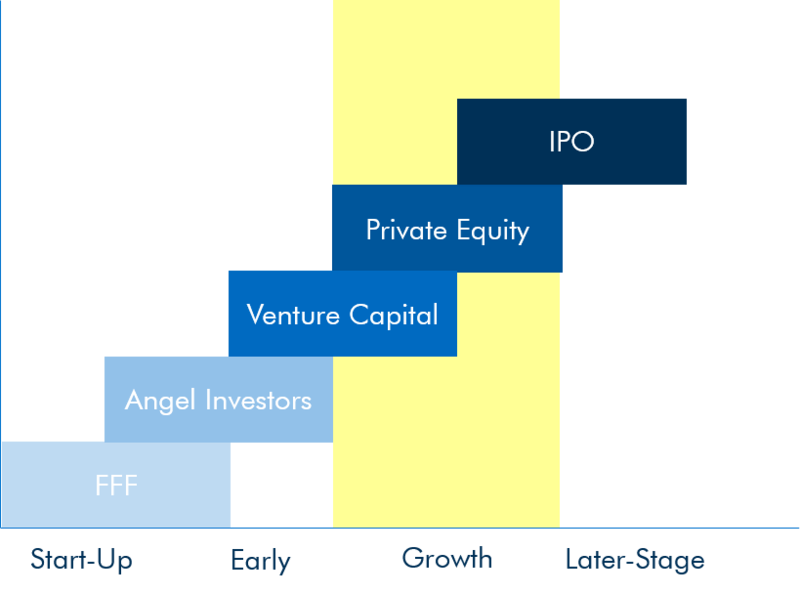 Initial Public Offerings (IPOs) happen later in a company’s life cycle. Please note: Although this chart might imply otherwise, IPOs are not the pinnacle of all (or even most) businesses. Many businesses will start, grow, and die with private capital. How many private equity firms are there? What are the different types of private equity firms? Not all private equity is equal. There are thousands of private equity firms in the US ranging in size. CapIQ, the finance industry’s top database for market intelligence, reports 2666 private equity firms in the United States. CapIQ reported the largest fund size of each private equity firm. The chart below displays the data. The chart shows the wide variety of private equity firms across the country. There are 279 firms with funds over $1B, 346 firms with funds less than $50M, and 1171 in between. At the top end, there are the industry giants of KKR, Blackstone, Carlyle, etc. These firms invest hundreds of millions and even billions of dollars to acquire public- and privately-held businesses. These are the deals you read about in the newspaper. Although they are a minority of private equity deals, they receive the majority of the press. At the lower end, there are private equity firms that invest $1-2 million in privately-held businesses. Your favorite coffee roaster or the local manufacturing plant could be private equity-controlled. Besides size, private equity firms can be distinguished by the industry or region they prefer to invest in. Many firms will only consider companies that operate in a specific sector or geographical location. What’s the difference between private equity-owned and private equity-controlled? A private equity firm is rarely the sole owner of a company but is almost always the majority owner. Private equity firms generally control 60-80% of a business. The other portion of the business is often owned by the business’ founder or the management team. How are private equity funds structured? What are LPs? What are GPs? Private equity firms raise funds of capital that invest in companies. The capital in the funds come from Limited Partners (LPs) and General Partners (GP). About 90% of a fund’s capital comes from LPs. GPs provide around 10% of the fund’s capital. Examples of LPs are insurance companies, trusts and endowments, pension funds, high net worth individuals, and banks. They are not involved in the fund day-to-day. It is simply an investment vehicle for their capital. GPs are individuals who run the fund as their day job. Many GPs have histories as bankers, accountants, or portfolio managers. They source deals, manage transactions, and maintain communication with companies the fund has invested in. The capital in the fund is used to invest in companies. When those companies are sold the profit is distributed between the LPs and GPs. 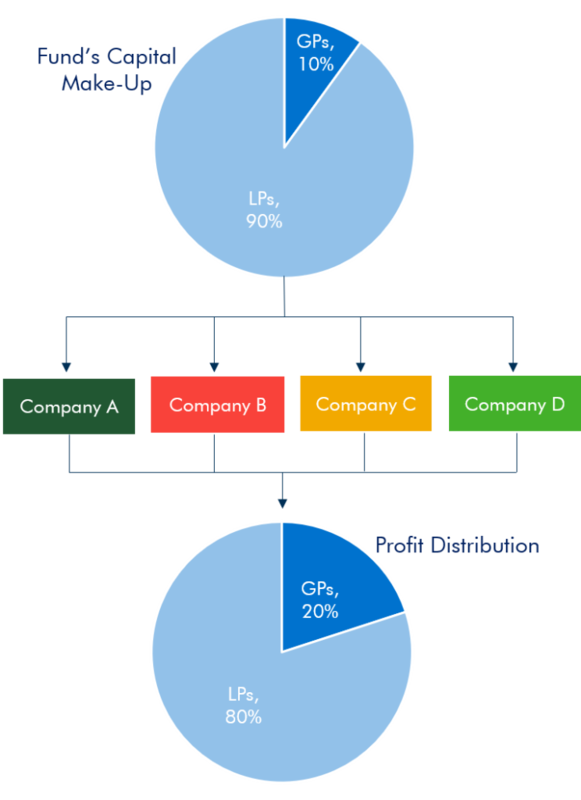 LPs generally receive 80% of the preferred return (if any). GPs get around 20% of the capital gains (if any). They also earn a management fee on the fund’s capital – 2% is standard. How do private equity firms source deals? Private equity deal sourcing is very inefficient. They review a large number of deals but a very small percentage gets closed. What is the life cycle of a private equity fund? What is the life cycle of a private equity investment? Most private equity firms have multiple funds of capital. The first couple years is spent raising the capital that will create the fund. As fundraising wraps up, GPs work with their deal sources to find companies they are interested in investing in. After closing those transactions, they will manage and grow the companies in their portfolio. When the GP sees that an exit can produce a rate of return that would meet or exceed the LPs expectations, they will sell the business. 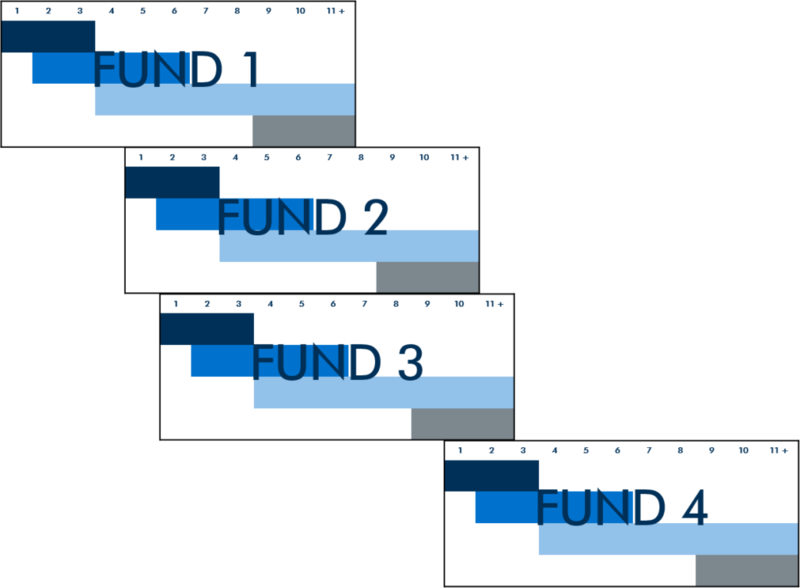 Many funds have a 10-year life cycle. Although, that has been changing in recent years with some funds choosing life cycles closer to 15 or 20 years. Most private equity firms have multiple funds. These funds run on different timelines. 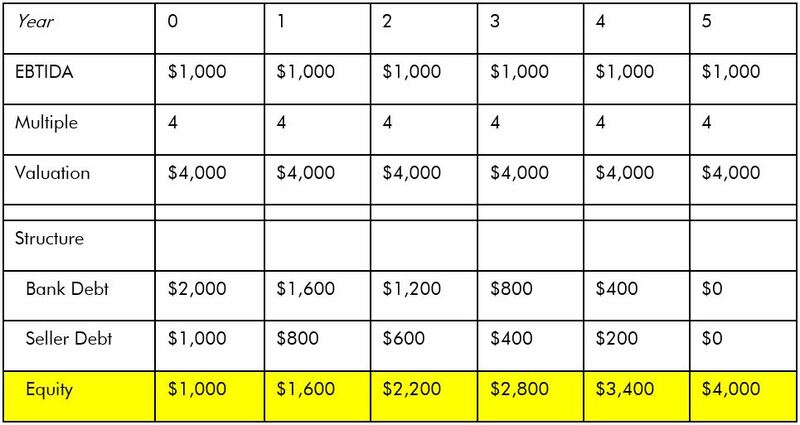 A private equity firm can be raising money for one fund while exiting a business to make a return on a different fund – as can be seen in the chart below. Just as each fund has a general life cycle, private equity firms follow a general cycle for each company they invest in. After firms invest in a company, they will operate it to create value, mange risk and position for an exit. When the company has grown to a point where the fund will make a satisfactory rate of return on the sale, the firm will sell their stake in the business. What is a“Buy & Hold” strategy? Some private equity firms will state that they have a “buy & hold” strategy. This means that the firms do not purchase businesses with a specific exit timeline in mind – they will own the business for an undetermined amount of time. What kinds of businesses do private equity firms invest in? Many private equity firms have specific industries, geographic areas, or revenue ranges that are important considerations when looking at a business to invest in. Remember – private equity firms are simply money managers. Investments are risky, so they must feel confident they can make a strong return on their capital in order to invest. Private equity firms may consider smaller companies as add-on’s. What’s the difference between platform and add-on acquisitions? Platform acquisitions are generally investments in large companies poised for growth. Platform companies are often the first major investment for a private equity fund. Add-on acquisitions are investments made after a platform is established. These companies are often smaller and provide synergies for the platform company. In our work with private equity firms we have seen that an attractive motivator in getting a deal done is seller participation in the capital structure of the business going forward. This often takes the form of seller financing and/or roll-over equity. Private equity firms find these options attractive because they allow the seller’s expertise to still be involved in the business’ operations. How do private equity firms structure deals? Most business buyers, private equity funds especially, use debt – even if they don’t need to. Here’s why: debt increases the fund’s rate of return. Because of that, debt is much more influential to private equity deals than most people realize. This chart lays out a simple scenario as an example. If you look at Year 0, you can see a private equity firm purchased a business for $4,000 – structured as 50% debt, 25% seller debt, and 25% equity. Each year after the acquisition, the debt portion of the firm’s ownership decreases and the equity portion increases. In this scenario the company’s valuation has stayed steady at $4,000 (although, companies usually do grow after five years). That means that the firm will get $4,000 on the sale of the company. Even though the company hasn’t grown, the private equity firm will still get 4x the equity they put in when they purchased it. This is because they chose to use debt when they made the acquisition. As time went on, debt diminished, and equity grew. Without debt, the firm would not have had such a strong rate of return. Why does private equity matter to me? …You’re in competition with private equity-controlled businesses. …Your vendors are private equity-controlled businesses. …Your customers are private equity-controlled businesses. 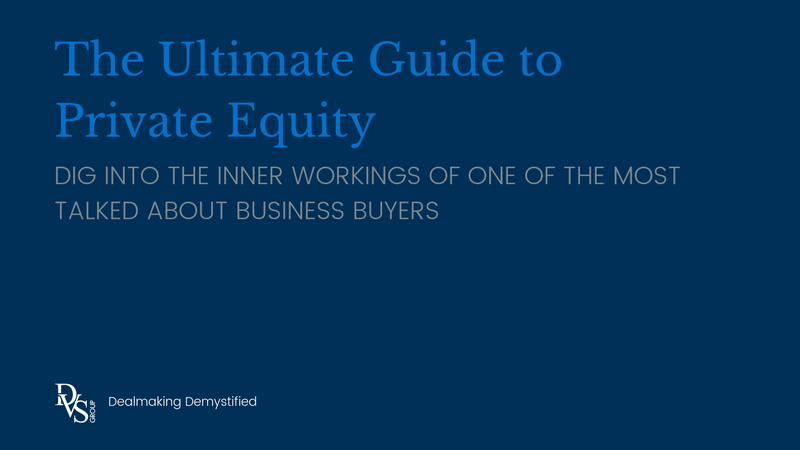 Getting the basics of private equity down will help you start to understand what makes the industry tick. Private equity firms are motivated to invest in businesses so they can make make a return on that investment when they sell their ownership share. GPs must satisfy LPs and LPs must satisfy board members and investors. It’s the game of making money grow and private equity firms are in it for the long haul (or at least until they reach their rate of return, then they’re gonna sell). What did we forget to cover? What other questions do you have about private equity? Comment below and we’ll be sure to answer! Thanks for helping me learn more about private equity. I had no idea that firms want to see about three years of profitability before they invest in a company. I’m kind of interested if more years of profitability would increase a company’s chances of getting an investment.